It’s been a while since we had a Cardiology case at St. Emlyn’s. If you haven’t already seen Cardiology cases 1 and 2, make sure you take a look. Check out our disclaimer too. We believe that sharing cases is a great way to learn – but we’re sure to protect the anonymity of real patients. All of our cases are based on our real-life experiences but we always change key details and often amalgamate features of different cases to communicate the learning points most effectively. This case is no different and we’ve used our imagination to illustrate the learning points for this one. This time round, we have the case of a 65 year old man who presented to the Emergency Department 2 hours after the onset of typical chest pain – the sort that you read about in text books: central, crushing and radiating to the left arm. This gentleman has an extensive cardiac history having had several previous myocardial infarctions and PCI on several occasions, most recently around 9 months ago. So what did the ECGs show? Are you missing the STEMI?! 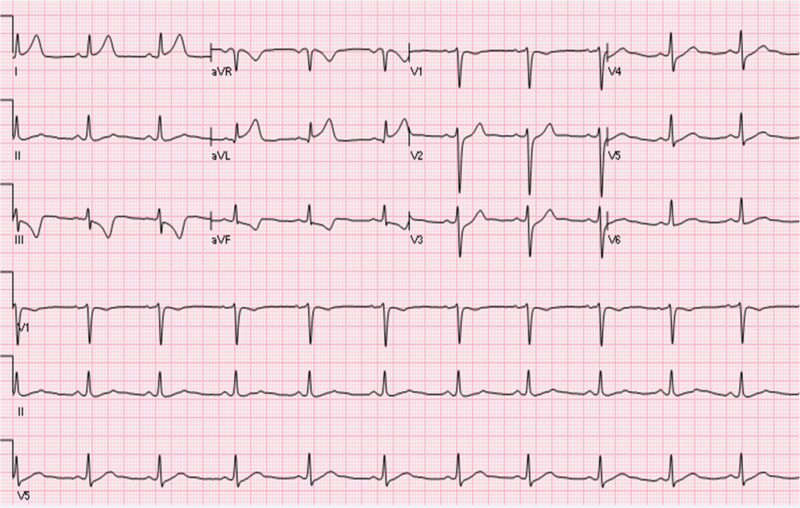 ECG 1 shows a high lateral STEMI. It’s subtle but there’s definite ST elevation in I and aVL with peaked T waves. There’s also ST depression in III and aVF with deep T inversion. In fact, the inferior ST depression and T inversion is probably the most obvious abnormality on this ECG. If you see inferior ST depression, always look at the high lateral leads as it’s often reciprocal. On this ECG we can also see some ST depression in V2-4, which is upsloping. Of course you might want to record some posterior leads on seeing that. On the repeat ECG we can see that the ST elevation in the high lateral leads is still present but less marked and the T waves are less peaked. The inferior ST depression has resolved and the T inversion far less marked. The anterior ST depression has also resolved. This is one of the most commonly missed STEMI patterns. People typically see the inferior ST depression and recognise this as ischaemic in nature, but leads I and aVL are commonly missed. Usually the ST elevation is also quite subtle, as in this case, which is often because the QRS voltage is low. Remember to interpret ST elevation in the context of the height of the corresponding QRS complex. The elevation is more subtle in leads with low QRS voltage. Pattern recognition is often the key to recognising STEMI here. 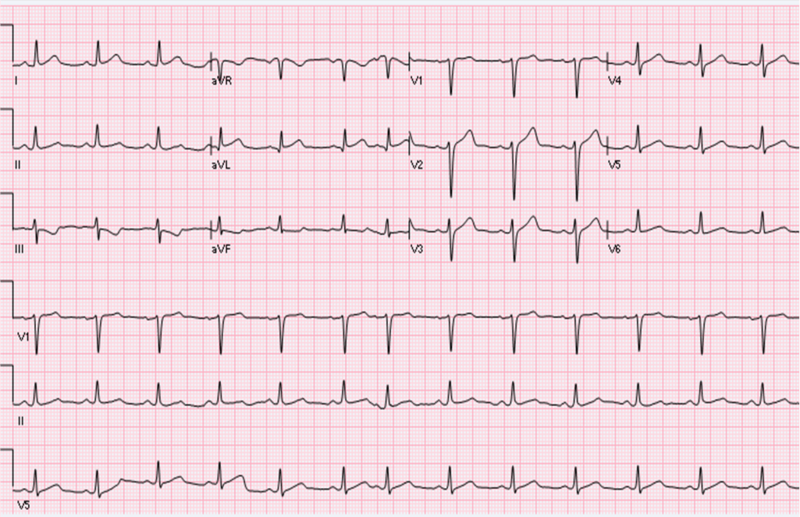 You can find another great case of high lateral STEMI at Steve Smith’s ECG blog. What does the troponin tell us? The troponin doesn’t tell us a lot. A 65 year old man with extensive cardiac history is quite likely to have a baseline troponin at the higher end of the normal range, if not above it – so we might reasonably expect that this is a normal baseline level for our patient. We certainly shouldn’t feel reassured that the troponin isn’t higher yet, as this patient could of course develop a late troponin rise. Given the ECG changes, a late troponin rise is a virtual certainty here. Remember that only 2 hours have elapsed since symptom onset. Even with a high sensitivity assay, troponins are only around 90% sensitive at the standard cut-off when measured at the time of initial presentation. That means that 1 in 10 patients with an acute myocardial infarction will have normal levels at the time of arrival. So, in summary, the troponin hasn’t ruled anything out here. Of course, we need to repeat it later. There’s an argument for repeating this after as little as 1 hour if you’re really uncertain about whether this patient has AMI. This algorithm remains unvalidated (as yet) but it seems that most patients with AMI will demonstrate a troponin rise if the sample is repeated as early as 1 hour later with a high sensitivity assay. You can establish a diagnosis of high lateral STEMI based on the ECG. Don’t let the initial troponin confuse you on this. The ECG doesn’t meet regular criteria for diagnosis and there’s ECG evidence of spontaneous reperfusion, so you should probably call your interventional cardiologist before directly activating the Cath Lab. Your cardiologist would surely appreciate that too, especially if you’re at a large centre like the Virchester Heart Attack Centre, where high demand means that primary PCI referrals may need to be triaged. However, this is a STEMI, and you should remember the time factor. The ultimate outcome will almost certainly be urgent loading with aspirin and ticagrelor and a trip to the Cath Lab for primary PCI. The cardiologists accepted this patient for primary PCI. He underwent intervention to a diagonal branch of the LAD, which was occluded. Troponin later peaked at 750ng/L. Another great early pick up in the Virchester ED. Previous: Previous post: JC: Updated NICE Head Injury Guidelines – Worth a Scan?